Kids with Autism . Ideas for decorating a bedroom. Ideas for decorating a bedroom. Decorating a bedroom for kids with autism can be a little tricky... Much depends on the severity of your child's condition. Not all of the suggestions here are necessary for all autistic children. If you are unsure of any of them, it would be wise to discuss it thoroughly with your doctor, therapists and teachers, before beginning to make-over your child's room. All furniture needs to be heavy and sturdy. Any shelves, dressers, and freestanding furniture need to be secured to the walls and/or the floor. You will need to have safety latches on all drawers, doors and cabinets that are used for storage. Safety plugs need to be put in electrical sockets. 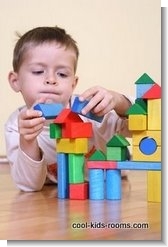 Keep all toys low enough that your child can reach them without climbing. Sharp edges on furniture need to be padded. Only buy a toy box with no lid, or remove the lid of one you already own. Cabinet and drawer knobs have to be too small to use for climbing, but too large to swallow. They must not be easily removable. When you are decorating a bedroom for kids with autism, you need to keep in mind that autistic children usually have trouble sleeping. One reason is because they are very sensitive to outside stimuli. Children usually can sleep through small noises, or being tucked in and kissed goodnight, but an autistic child can react strongly to this. There are a couple things you can do to help prevent this problem. Carpeting the floor will soften the sound of footsteps. Make sure the doors don't creak when opened. And use blackout curtains to eliminate the light. You don't want curtains that can be yanked down or get tangled up in. Window blinds and shades need to have their cords removed or tied in a fashion that protects your child. It is a good idea to install window guards at the bottom of windows. In your special needs bedroom, make certain that furniture isn't placed to allow easy access to windows or door locks. Parents really have a good idea about what upsets or calms their children. If your autistic child has a favorite color, paint his walls with it. Calming colors are usually the best bet, but if he wants orange, let him have it. Many of these special needs kids like bean bag chairs. A calming corner is a good thing to have. Fill the corner with blankets and pillows, and his favorite stuffed animals. He will head there for comfort after a tantrum, or when he is frightened or confuse. 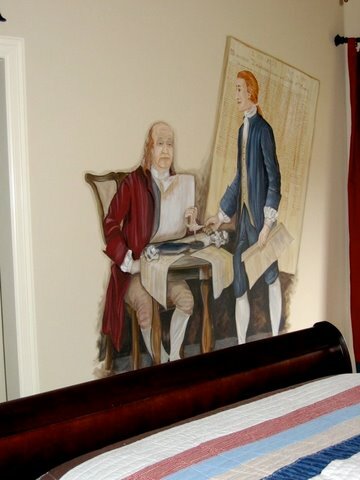 Courtesy of Ann Simmons from Simmons Design: “This little boy and his brother both have autism and it was his dream to have a room with Thomas Jefferson, Ben Franklin and George Washington and the Declaration of Independence. His mom says he spends hours in his room with all his history books. 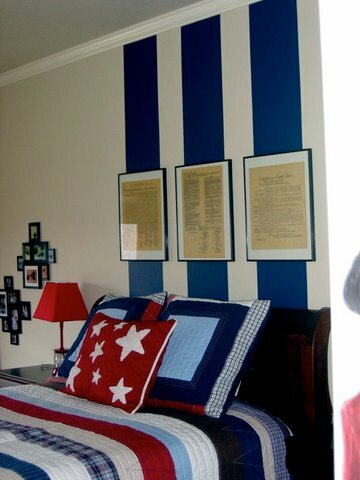 David picked out his favorite government articles and we had them framed and put in a special place over his bed. Although, David has autism he and I had great conversations about every aspect of his history room. David told me the young Thomas Jefferson was red headed - so you learn something new everyday. With careful thought, decorating a bedroom for kids with autism will be successful!